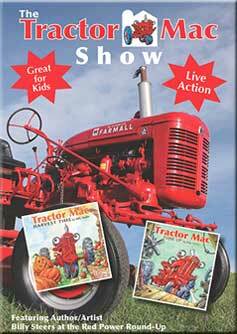 The Tractor Mac Show is a blend of fun stories, original music, educational segments, vintage Farmall tractors, and Case IH tractors. Read along as Billy Steers reads his Tune-Up and Harvest Time books. See the pages come alive with sounds and motion. Kids will learn about the main parts of a tractor and how a gas-powered engine works. We visit the Red Power Round-Up to see vintage Farmall tractors on parade. Watch giant steam-powered tractors hissing steam, belching smoke, and blowing their shrill whistles. See Case IH tractors working the fields � cutting hay and carrying the hay to hungry horses. This live-action, highly entertaining and educational DVD will thrill and delight both kids and grown-ups. Finally, a show the entire family can enjoy. brian (Iowa) on 2015-02-10 01:09:53. Tractor Mac is the best kids tractor dvd out there. My sons watches this all the time and it one of the few kids shows I don't mind having to watch with him. Really wish there were more tractor mac dvds to buy. We have the john deere series, and prefer this one by far. More technical with the parts and learning but animated enough to keep a 2 year olds attention. Thanks. Lisa (Limerick, PA) on 2013-03-02 13:19:37. Excellent movie! My grandson love the Tractor Mac books, now the video is a great addition to his library. Even us adults loved watching it!